We have marked the figures with three different colours, firstly light orange to represent less than 50 loans issued, light blue for 51 – 200 and white for 201+. 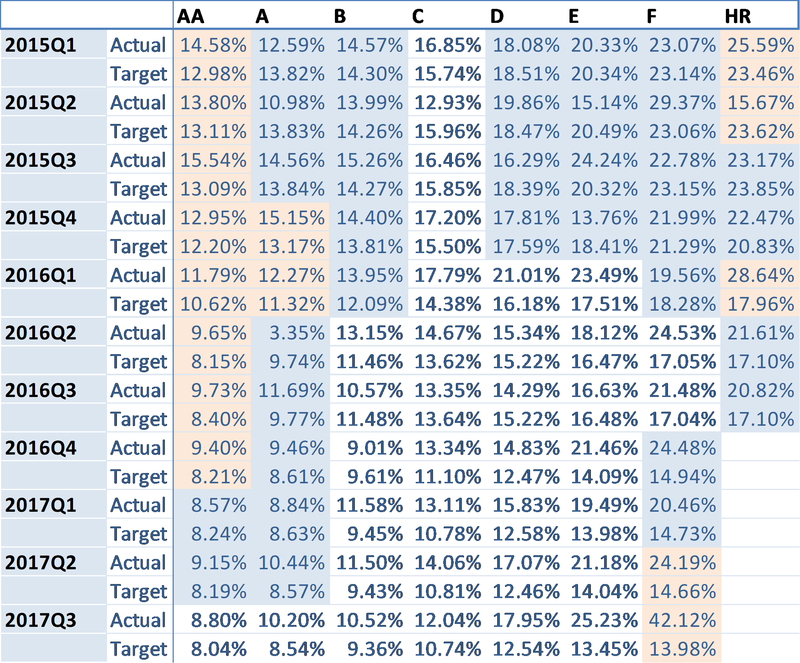 This is a great way to spot anomalies, such as high volatility in low risk ratings. Across all countries, the best performing quarter so far was seen in Q1 of 2016 at 16.22%, 2.49% above the target. The most common credit rating of loans issued in Spain has historically been HR, with nothing above a C rating allocated since Q2 of 2015 (Which totalled under 50 loans altogether). C rated loans in Estonia are the only credit grading which have been issued over 200+ PCS each consecutive quarter since 2015. Across all countries and risk ratings, the highest actual net return was seen in 2010 at 29.72%. As mentioned above, it’s important to note here that the most recent data will nearly always show a high return as the loans have only recently been issued and at this point the interest element accounts for a high percentage of the total payment. Older data, for example 2009 – 2012, is showing as having the highest return as loans from this period may still receive a cash flow from recovery payments. 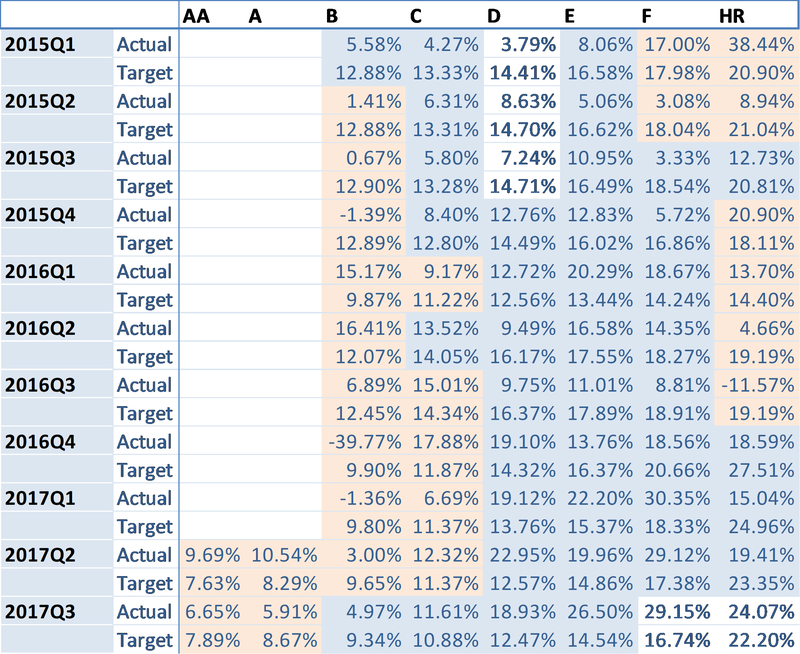 This reinforces how you can maximise your absolute return in P2P by taking a long term view with your investments. 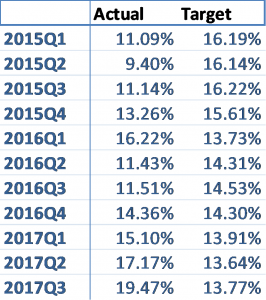 Overall, the average actual net return across all quarters comes in at 13.61%, slightly below the target average of 14.76%. 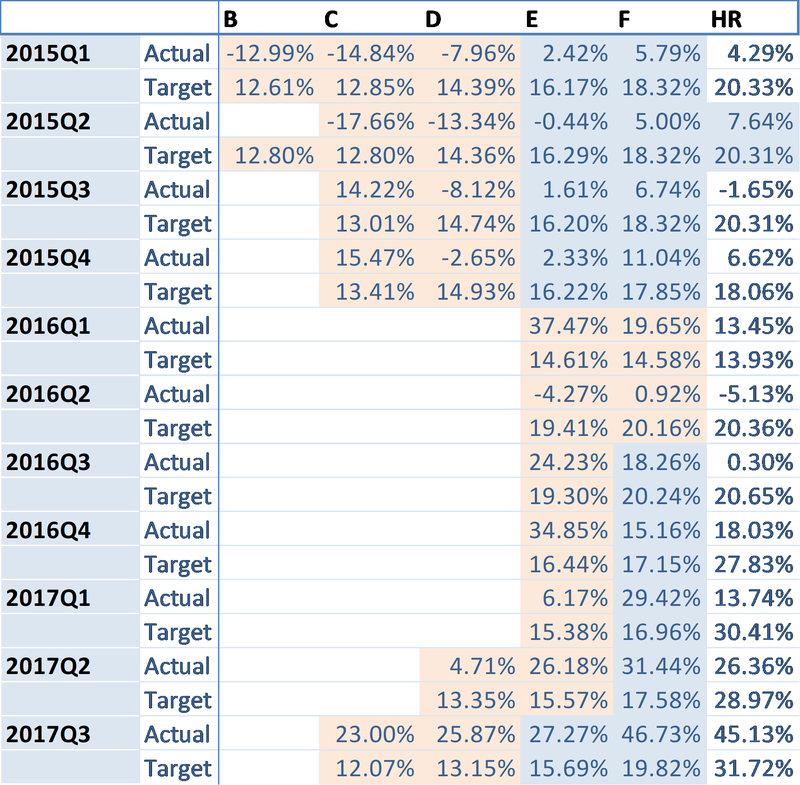 The best performing quarter in 2015 was Q4 at 13.26%, in 2016 this was Q1 at 16.22%. 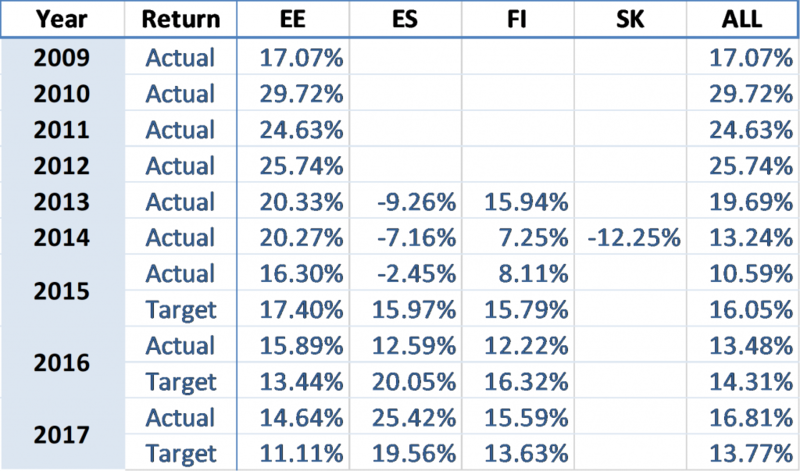 When looking at the total actual return across all credit ratings, the actual return has been higher than the target in every quarter but one (2015 Q2). In Q2 of 2015, the actual interest rate achieved for HR loans was 15.67% (7.95% below the target) however this was only from a sample of 5 loans. For data over 12 months old, the best performing quarter was Q1 of 2016. Only a small percentage of Finnish loans issued total over 200 PCS, most recently in Q3 of 2017 this was seen in F & HR ratings. The actual return figure for Q4 of 2016 B rated loans shows a rate of -39.77%, however the data is significantly skewed due to less than 5 loans being issued. In Q1, Q2 and Q3 of 2017, the HR rating had the highest number of PCS issued overall. Q3 of 2017 saw the highest number of HR loan PCS issued in Spain at 1,721. The highest total actual return figure over 12 months old was seen in Q4 of 2016 at 22.68%.